A filming sign points the way for FOX's Star. It was one of the most popular shows of 2016, reminding us of our favorite 80s films, Eggo waffles, and, well, MKUltra. Netflix’s Stranger Things (production code: BRIDE) beamed into our homes in July, and by August, had been renewed for season two, which has been described as more akin to a sequel than a second season. Filming started this month, with Winona Ryder, David Harbour, and Millie Bobby Brown all reprising their roles, along with the boys: Gaten Matarazzo, Caleb McLaughlin, Finn Wolfhard, and Noah Schnapp. 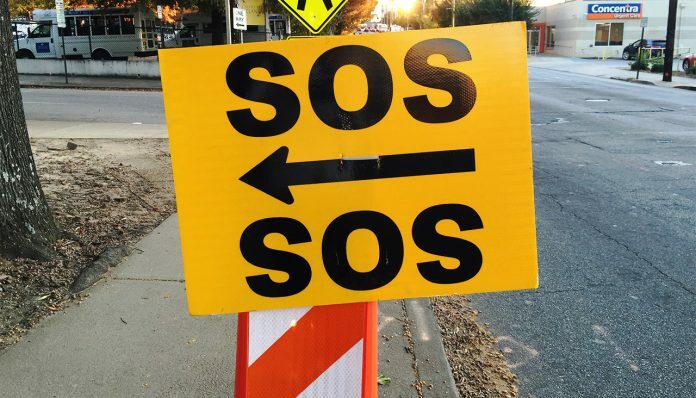 Signs for Stranger Things were spotted off of GA 166 and Lakewood Avenue on November 2. Filming also took place in Stockbridge on the 14th. Crews worked in Stone Mountain on November 18. After that, production moved to Lilburn near Five Forks Trickum Road. Most recently, Stranger Things was in Douglasville on November 22. Around the time of last month’s update, BET started filming a new show, The Quad (GAMU), a drama about life at a historically black college. Tony Award-winning actress Anika Noni Rose stars as the newly elected president of the school. Morehouse College serves as the backdrop for the series, standing in as the fictional Georgia A&M. This month, we saw filming there between November 3 and November 5, as well as on the 18th. Elsewhere, GAMU signs were spotted on Lakewood Avenue on the 2nd, and in Midtown on November 17. One of the most interesting things to have filmed in Atlanta this month is Simran (SPITFIRE), a Bollywood film. Production actually started last month OTP, but we just recently saw evidence of this shoot intown. Simran stars Kangana Ranaut, who is one of the highest-paid actresses in India. If you’re wondering why this film chose to shoot entirely in the United States, the plot will explain it—Simran is about a nurse who, after coming to the U.S., gets into gambling debt and pays it off by robbing banks. The film was spotted downtown at the start of November, in Clarkston on the 5th, and in Griffin on November 8. Despite the imminent winter break looming over productions, three new films have begun principle photography. Jumanji (JAGUAR), a sequel to the 1995 family classic starring Dwayne ‘The Rock’ Johnson, Kevin Hart, Jack Black, Karen Gillan, and Nick Jonas, set up downtown on Ted Turner Drive near the Sam Nunn Atlanta Federal Center. 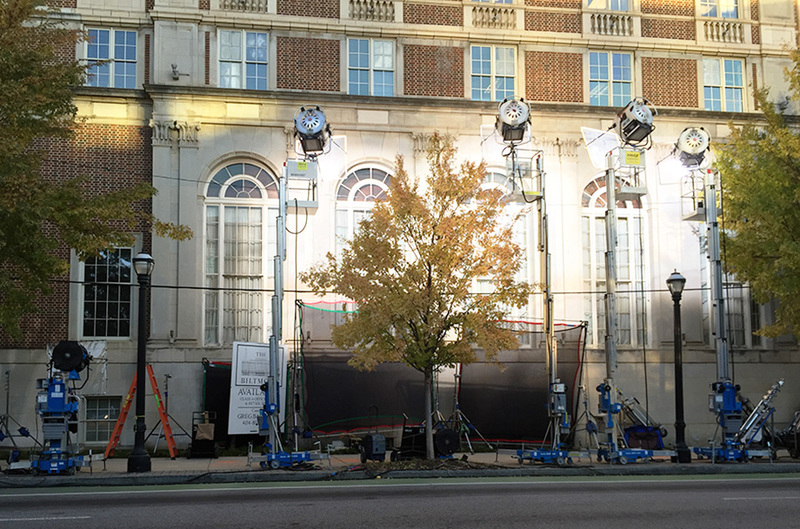 Hangman, starring Al Pacino, Karl Urban, and Brittany Snow, filmed in Virginia-Highland on the 18th. An Actor Prepares will shoot in Serenbe on November 29, bringing Jeremy Irons, Jack Huston, and Megalyn Echikunwoke with it. We’ll have more info on those next month. Star (SOS), the Queen Latifah and Benjamin Bratt-driven Empire spinoff, continued shooting in Atlanta this month. On October 29, crews worked at Epicenter, near Six Flags. We also saw a basecamp near Atlantic Station at the end of October. Recently, crews worked at the Biltmore Hotel in Midtown. Star films outside the Biltmore Hotel. Hap and Leonard (H&P), the SundanceTV dark comedy, also continued shooting in November. After finishing up October in Austell, we saw signs off of GA 166 in Douglasville. On November 4, filming took place in Newnan. On the 11th, signs were up at Fun Junction USA in Fayetteville. MacGyver (EYE) was in East Atlanta and Lawrenceville at the end of October. They also shot off of Peachtree Road on November 18. Netflix’s Ozark (BYRDE) had signs up at the Windward Parkway exit off of GA 400 on the 9th. They also had a basecamp at Birmingham United Methodist Church in Milton on the 10th. In the middle of November, crews worked in historic Roswell. Sleepy Hollow (SH) was in Dunwoody between November 10-11. On the 14th, the FOX series shot at the High Museum of Art. Two days later, they were near the Five Points MARTA station. Yesterday, signs were spotted off the Buford-Spring Connector’s Piedmont Road south exit. 24: Legacy (LEGACY) had signs up near the West End during the middle of the month. Diary of a Wimpy Kid: The Long Haul (DWK) shot in Covington and near The Colonnade at the end of October. The Vampire Diaries (LOC) continued filming its farewell season with appearances at the Atlanta Motor Speedway on November 6, and in Decatur on November 21. We’ve also learned that Avengers: Infinity War Part I may have quietly started filming. The movie’s working title is “Mary Lou,” and signs with the production code ML have popped up in Fayetteville near Pinewood Atlanta Studios, where production is scheduled to take place. We can’t confirm that the signs are for Infinity War, but it’s certainly a peculiar coincidence.